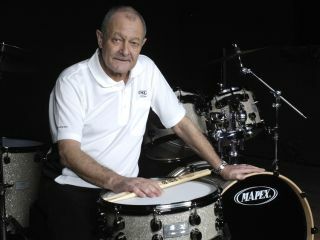 PRESS RELEASE: Bob Armstrong, the UK's leading drum teacher, is the latest in a long list of high profile players to join the Mapex team of endorsees. Bob's masterclasses have been established for many years. He has an outstanding reputation, with many of today's star players learning their craft in his studio. As well as Steve and Alan White, Andy Gangadeen and Darrin Mooney, Bob's roster of students has included Gary O'Toole, Pete Riley, Chris Dagley, Andrew Small, and Phil Gould to name but a few. Pete Havard of Mapex had this to say, "The team here at Mapex are delighted to work with such a fantastic educator who has helped shape some of the world's finest drummers and continues to be a leading light in musical education." Bob currently has a long list of students and a waiting list. He'll be using his Mapex Meridian and Saturn Series kits to take them through their paces.